Love temples and ancient history? 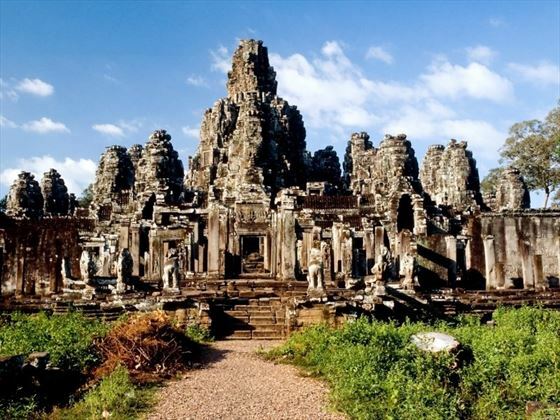 Then this eight-day tour of Thailand and Cambodia is perfect for you. 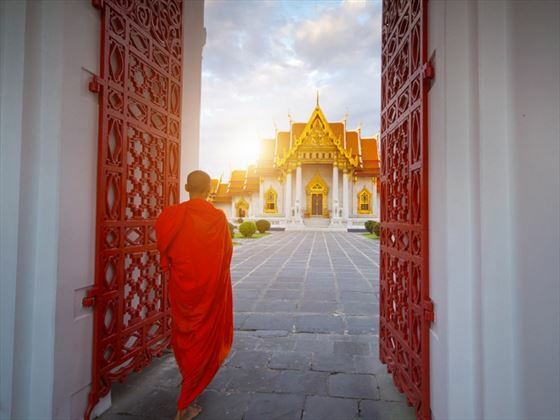 Start in Bangkok, where you’ll visit the ornate riverside temple Wat Arun and continue to Cambodia for a two-day tour of the UNESCO-listed Angkor Archaeological Park. 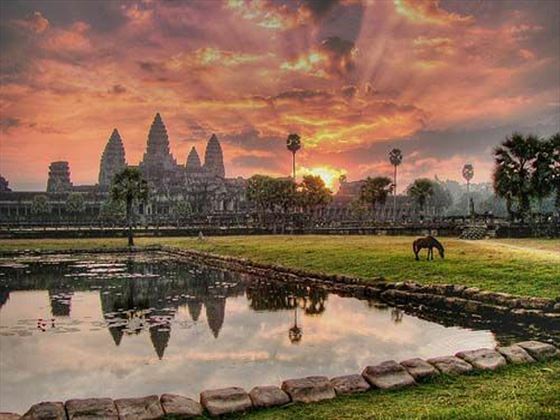 The pinnacle of the trip is visiting majestic, 12th century Angkor Wat, one of the Seven Wonders of the World. Other highlights include boat trips in Bangkok and watching local artists perform at the Phare Cambodian Circus. You’ll get the chance to visit traditional villages, sail across Tonle Sap Lake and see an authentic Thai puppet show in Bangkok. This trip is ideal for people who love history, culture and exploring exquisite temples (BRT-BATCBB). Tour Bangkok by boat, visiting temples and puppet shows. Spend an evening at the exciting Phare Cambodian Circus. Temple-hop around UNESCO-listed Angkor Archaeological Park. Sail across southeast Asia’s largest lake, Tonle Sap. 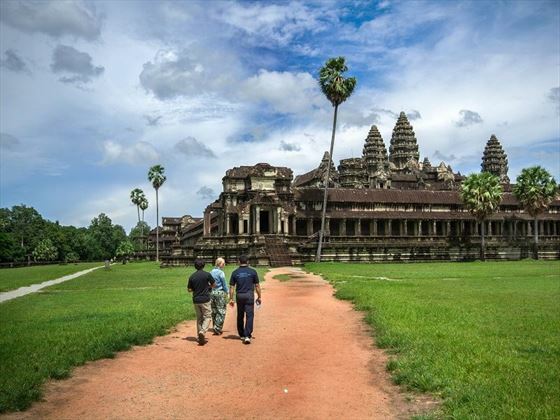 Learn about Angkor Wat’s construction and impressive stone carvings. Meet and dine with villagers in Cambodia. Enjoy a dinner cruise on the Chao Phraya River in Bangkok. Welcome to Thailand! 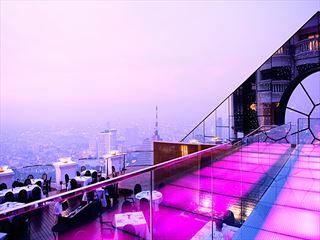 Your adventure begins in the capital, Bangkok, where you’ll check into your hotel. Meet your tour group over dinner at a local restaurant. Overnight: Theatre Residnece (Dinner included). Enjoy a leisurely morning before boarding a long-tail boat to explore Bangkok’s khlongs, canals, which are lined with Thai houses. Stop to see a puppet show at the Khlong Bang Luang Artist Village and then continue down the Chao Phraya River. You’ll pass some of the city’s most famous buildings, stopping to explore Wat Arun and the Grand Palace. The day ends with a street food tour of Bangkok by tuk tuk. Overnight: Theatre Residnece (Breakfast and lunch included). Say goodbye to Thailand and fly to Cambodia. 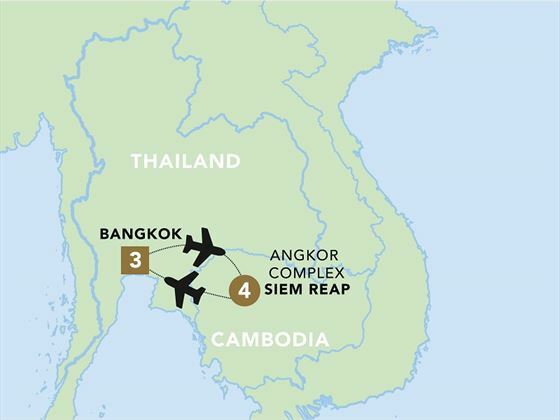 You’ll land in Siem Reap, the jumping off point for trips to the Angkor Archeological Park. Settle in and explore this vibrant city independently or relax at the hotel before tomorrow’s big temple tour. 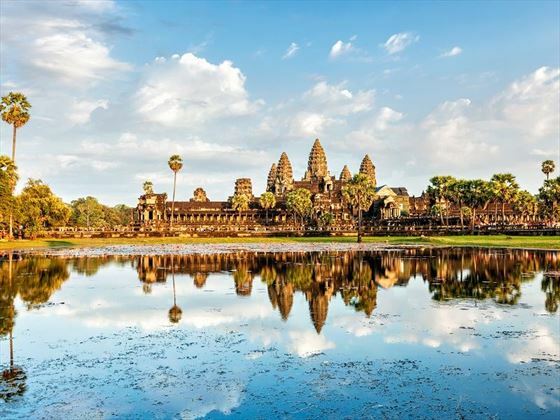 Enjoy a day of hopping around UNESCO-listed temples, starting with mighty Angkor Wat itself. One of the region’s leading stone conservation experts will tell you all about the 12th century temple, including how the site was designed and carved. Other highlights include Ta Prohm, one of Angkor’s most distinctive temples which is set in the forest, its structure intertwined with tree roots. The site is so atmospheric it was used as the setting for the movie Tomb Raider. End the day with a gondola cruise along the moat of Angkor Thom while the sun sets. Continue your temple explorations today with a trip to Banteay Srey and Banteay Samre. In the morning, you’ll tour some more peaceful spots, including Ta Som and Neak Pean. Your last stop will be Preah Khan, which is set in a jungle and features maze-like corridors and elaborate carvings. After relaxing over dinner, you’ll spend the night at the Phare Cambodian Circus, often referred to as the Cambodian Cirque Du Soleil. Watch local artists perform stunning contortion and acrobatics, dance, music and theatre acts. Today you’ll visit Tonle Sap, which is the largest lake in Southeast Asia. Cruise across to Kampong Phluk, a Khmer village comprised of houses built on wooden stilts. Pass fishermen and sail through a mangrove forest which is home to all kinds of wildlife, including colourful birds. Back on land, we’ll visit the village of Chansar to learn about rural life, taking an ox cart ride through the fields to a Khmer home. Meet the family, who make a living from producing brooms made from natural materials and experience being blessed by monks. 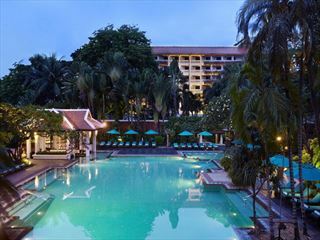 Return to Siem Reap, where you can spend the evening as you please. Fly back to Bangkok this morning and spend some free time before tonight’s entertainment, a farewell dinner cruise. Dine and enjoy drinks as you sail along the Chao Phraya River, taking in the city illuminated by night. Your Asian temple-hopping holiday ends today with breakfast and a transfer to the airport. Accommodation: seven nights in boutique hotels. Transport: air-conditioned vehicle, internal flights, boat. Food: seven breakfasts, four lunches and four dinners. Activities: Bangkok street food tour and boat tour including puppet show and entrance to Wat Arun. Entrance to the Angkor Archeological Park and Phare Circus performance. Tonle Sap boat trip and visit to traditional villages. Bangkok dinner cruise. Please note that you may need a visa for entry into Cambodia as well as for Thailand therefore, please allow enough time to check the visa requirements and apply where necessary before travelling.